Witty and adventurous, this movie might not be anything super creative or unique, but it is still a good time. A movie about a woman who has to go to the jungle to rescue her kidnapped sister, this one turns out to be a lot of fun. Chalk that up to the creative adventures these characters get themselves into, including mud slides and vine swinging, all while outrunning a group of gunmen. Kathleen Turner and Michael Douglas have real chemistry together, so much so that they made two other films with each other shortly after this one. Romancing, of course, is the movie that started it all. It’s a very entertaining and comical thrill ride. Romancing The Stone is a fun movie. It’s an adventure film that was such a hit it spawned a sequel called the Jewel Of The Nile with the same three lead actors. These three then went on to make the War Of The Roses together, a black comedy classic. 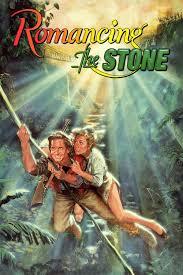 Romancing The Stone is the film that started it all. The movie is about an author whose sister gets kidnapped, forcing her to go to Columbia to try and rescue her. Kathleen Turner plays Joan Wilder, this author of steamy romantic novels. The movie opens with a fantasy from one of her books where she ends up stuck in a small shack in the old west, and being held prisoner. Joan shoots her way out of it and saves herself. We quickly learn that this was all in her imagination, as Joan is really safe and sound in her upscale Manhattan apartment. Still the scene says something about what kind of person Joan is. The kind who imagines she would be able to handle anything and rescue her from trouble. Unfortunately, her sister is not like that. We go to Columbia where we see Joan’s sister (recognizable because she has sisters of herself with Joan in her hotel room.) the sister is clearly naive as she drives a nice convertible into an area with kids hanging out in the streets. The kids throw something at her head that knocks her out and then one of them gets into the car with her and drives it off. Pretty soon Joan is getting a call from the kidnappers about her sister. She immediately jumps into action, telling her publicist that she’s got to go to Columbia to get her sister back. The publicist can’t believe it and thinks Joan is crazy. What makes her think that she can do this and handle it? Joan pays her no mind, asks her to watch her cat while she’s away, and takes off. So starts the adventure. While Joan is traveling, we start to follow the villain character, played by Danny Devito. He’s an American in Columbia who is after something that the sister’s husband sent to Joan. The sister’s husband was killed down there, and that’s the reason why the sister went down. To claim his body. Well, it turns out the husband was killed because he has something that others want. A treasure map. He sent it to Joan and the kidnappers took her sister. Once in Columbia, Joan gets on the wrong bus and ends up being driven out into the middle of the jungle. To make matters worse, there’s a guy on the bus that works for Ralph (Danny Devito), the kidnapper, and is following her. The bus gets into an accident and everyone gets out. That’s when Jack T. Colton (Michael Douglas) shows up just in time to see Joan being held at gunpoint by the man who has been following her. After reaching a number they both agree on, the two of them set off together. That’s where the fun really begins. First there’s a massive mudslide that looks like an incredible stunt. Both of them end up getting sucked down the side of a mountain. After that, they get chased by gunmen and have to rely on vine swinging to get across a cliff. It’s by accident that this is discovered with Joan being the one who gets her foot stuck in a vine and swings over to the other side first. When the action settles down, so do our characters. They find an abandoned, crashed plane and camp there for the night. This is when the two of them first really start to get to know each other. It’s also when they have an encounter with a rattlesnake. After the plane scene, the two of them leave the jungle and make it into the city, where they get cleaned up and welcomed back to civilization. Suddenly the romance between the two of them takes over, but the bad guys still have Joan’s sister, so we still have plenty more to go. The final climactic scenes end up being a series of car chases, and not half as good as the jungle scenes. That’s just a testament to how much fun this movie was when it kept the characters in the jungle. That was most of the film, and it’s when this movie found its niche and area where it could be unique. Once the car chases on city streets start up, the movie begins to feel like a thousand other films that we’ve seen before. Still, for everything that happened out in the jungle and for the interesting plot about the kidnapping, this is a pretty good film.